Taormina is 67 km north of Catania Airport. The agreed reduced-cost for conference attendees of door-to-door car service from Catania Airport to your hotel in Taormina is 80 euros for 1-3 people, and a Mercedes VITO van for 4-6 people is 120 euros total. It is 150 euros total for 7 or 8 people. If you can form a group, this is an excellent choice. You can also ask Stefania to put a group together if colleagues arrive at the same time. That will reduce the cost. The final cost will be determined by how many people are in the vehicle. Payment for taxis/car service, even if arranged by a hotel, is in cash (Euros) directly to the taxi driver. Tipping is not expected or necessary, but optional (5 Euros each if in a group, and 10 Euros to driver if you are alone, suggested if you decide to give a tip). Bus: turn right when you leave the Baggage Claim area at Catania Airport, and exit the building. As you walk out the door, the first small booth outside on your right sells bus tickets to Taormina. The bus goes into Catania city center, then makes several stops in Giardini Naxos (the seaside town below Taormina), and continues up to Taormina, where you get off at the bus terminal on Via Luigi Pirandello below Taormina center (the end of the bus route). From here, you can walk to your hotel or take a taxi, depending on how tired you are and how many bags you have. 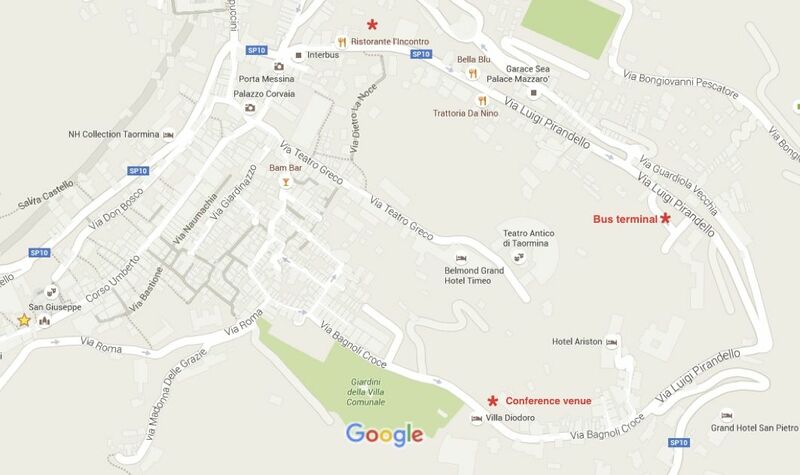 If you are going to the Conference venue (Hotel Villa Diodoro) or a nearby hotel, it is easiest to walk downhill from the bus station for 15 minutes and around to the hotels (see map below). If you are walking to a hotel in Taormina town center, you would walk up the street from the bus station for 5 minutes, turning left at the arch (the Porta Messina) and entering the Corso Umberto, which is the main street in Taormina town center. Cost for the bus is ~9 euros. Time: ~ 90 minutes to the bus terminal in Taormina. Car rental: you can rent a car at Catania airport and drive up the Autostrada the 67 km to Taormina. There are several large car parks, but car rental for the week is more expensive than a car service. Also, Taormina is a pedestrian town and a car will be useless unless you are exploring outside of town. If you want to leave Taormina for the day during the conference, you can always rent a car for the day in Taormina center, and drop it off the same day without incurring parking fees (~20 euros per day for parking). Train: from the airport, you take a bus into Catania to the train station, and the train goes to Giardini Naxos, where you then have to get a cab or bus up to Taormina. We don't recommend this. It takes longer and the train doesn't go up to Taormina. Summary: we suggest car service from Catania Airport to Taormina- faster and very convenient. Not much more than a bus if you form a group. European cities with direct flights to Catania include London Gatwick, Paris, Berlin, Milan Linate, Milan Bergamo, Milan Malpensa, Verona, Amsterdam, Brussels, Geneva, Munich, Vienna, Copenhagen, and Barcelona. Skyscanner.com is an excellent search engine that finds flights from both major airlines and smaller airlines, including Volotea, Norwegian, Easyjet, Ryanair, Air Berlin, Eurowings, and Meridiana. For those coming from outside Europe: in terms of cost, you might be better off getting two tickets, one to a European city with direct connections to Catania, and a second ticket to Catania. For example, a ticket to Rome and an Alitalia ticket from Rome to Catania. However, international flights to Rome are usually expensive. The point is that search engines focus on the destination, not the cost of the separate flight segments. By having London or another major destination as the final search location, you can get a much lower fare on the first part of the trip.